With summer slowing down I have been gazing longingly at my yard. When I saw this book at the library, I grabbed it and have enjoyed browsing through it. The best part about this book is the step-by-step instructions for executing the design. The second section of the books describes how to prepare and plant each type of groundcover. I didn’t know that heavy clay soil has to be “decompacted” in order for most plants to establish well. You must break up the clay so that roots can spread throughout the soil. He recommends digging to a depth of 30 cm, but I don’t think I am strong enough to dig Arizona soil that far. I also learned that a gravel mulch 6 cm deep is thick enough to suppress germination of most weeds. The hands-on landscaping expertise makes this book a valuable resource. I like how Mr Filippi encourages us to embrace plants in all seasons and plan for summer dormancy in dry areas. A summer dormant landscape in Arizona conserves water and requires less care when it is least comfortable to be outside. Same demonstration garden in summer. Images from mediterraneangardensociety.org. This book has a disadvantage of using plants for European landscapes. While some of the plants may be available here, the goal of xeriscaping ideally uses plants from the same region that are most ideally situated for the climate. The concepts in this book can easily be transferred to a palette of southwestern plants. If you like reading landscaping books, I definitely recommend this one. I haven’t posted in awhile. I was considering why not, and it occurred to me that a Do-It-Yourself-er saves money by working on projects themselves. But when all the work is done by you, projects compete with your other priorities for your time and just don’t always come in first. For all you DIY-ers who are going strong this spring, I just added a new page on backyard landscape design ideas. It includes ideas for planning your dream backyard. This past year I haven’t put yard improvements at the top of my list, but I still have been able to enjoy my landscape. Many of the plants I added when first moving here are reaching mature sizes. I enjoy walking around the yard and seeing the flowers and new growth during spring. This is the part of landscaping that I find rewarding: a beautiful space that complements the surrounding desert and inspires me. So, when a landscape is in stasis, what do I do to maintain everything? So far this year we’ve harvested citrus fruit, pruned trees and bushes, sprayed pre-emergent on all rocked areas, weeded around plants, planted a small garden, and added a few new plants. Spring is a good time to check that all irrigation emitters are working properly. The seals on the irrigation valve near the house get old and leaky, requiring replacement every few years. A xeriscape landscape is easier to maintain than many others because many of these chores are only done once a year. This year my garden included lettuce, sunflowers, and zucchini. The lettuce is already bolting in the heat and the zucchini will die off in another month. The birds love the sunflowers. 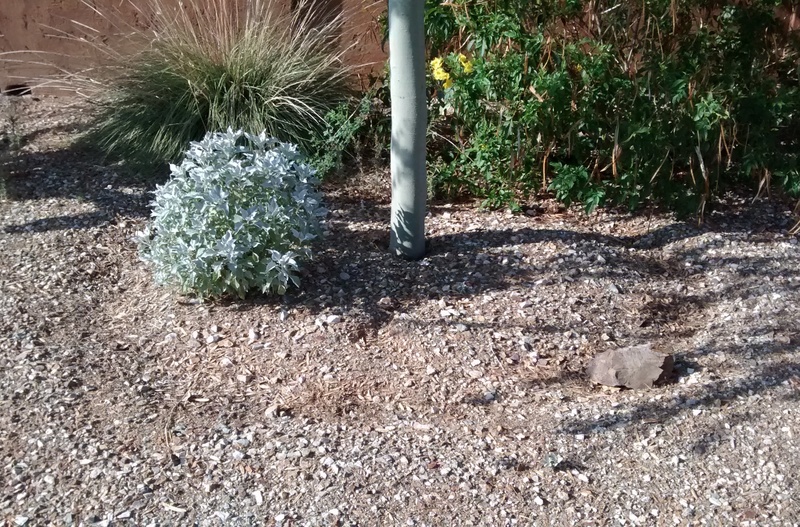 I added a couple of new native plants this year that I found at the Black Mountain Nursery in Cave Creek. I found Mormon tea, goldeneye, and desert milkweed there. I have better luck finding native plants at independent nurseries than at chain stores. In the future, I still have plans to do some big projects in the yard. I would like to build a ramada-style porch extension, add crushed granite on all walkways, install flagstone pavers on the back porch and some artificial turf immediately off of that, and finish landscaping one area with some more shrubs. Whether you’re starting projects or enjoying what you have, hope you enjoy your landscape this spring! To get the Christmas spirit before I had set up my tree, I made this branch arrangement from Mesquite branch trimmings. The branches sat in the yard, awaiting our next evening by the fire. Instead, I rescued them and arranged them in a sturdy vase. I had to make sure the stems were long enough, and tried to arrange without getting too close to the spines. I filled the vase with some rock from my yard to keep it stable. Then I hung some inexpensive ornaments. I like it! Here’s a sunset enjoyed from our driveway. Jojoba in the foreground and Queen Palm in back. I love our winters and feel just as Christmas-y with warm days and light strand-wrapped saguaros. We put up our tree, a live pine cut here in Arizona. We’ve enjoyed some Charlie Brown style trees in our time here in Arizona, but each tree has been truly beautiful in its unique way. I like this ornament, and the message to remember Christ. Thinking of our Savior and feeling His Spirit brings Christmas to me. So…Merry Christmas! May you feel joy and peace in this wonderful season. For more inspiration, see what a Savior means to me at mormon.org. August felt blisteringly long this year. With the nuclear heat, I didn’t go outside much. Just enjoyed the view of my landscape from indoors. Now that it’s September and the nighttime lows are coming down, it’s time to get outside and see how my plants survived. Most of my established plants made it through just fine. The front yard irrigation timer shorted out and nothing got watered for about a month. Things started showing signs of stress, but I hand watered and got the system running again. 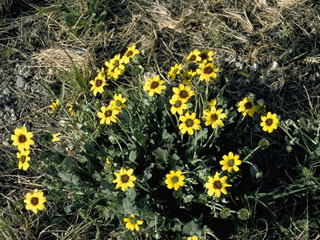 The Spanish dagger and yellow bells showed the worst stress, along with a young slipper plant. 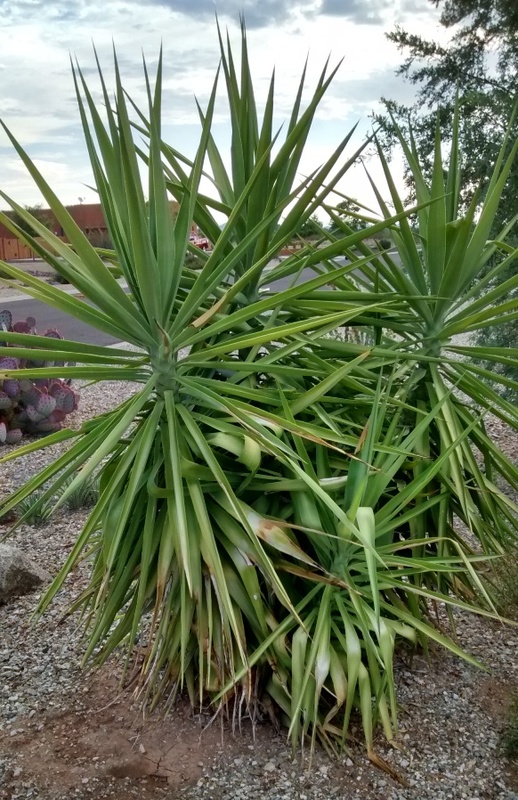 Spanish dagger showing signs of heat stress. This yucca likes regular water. A young slipper plant has brown at the base of each stalk. It may be too damaged to survive. In the back yard, I should have watered my smaller/younger cacti to help them through. Many showed signs of sunburn at the end of August. I didn’t notice any sunburn in mid-August when I looked at the yard, but at the end of the month, BAM! The summer rains washed away most of the basins around my plants, so last week I rebuilt them. Now I’ll be able to give them larger drinks. A little attention and everything will flourish. Baby Cardon with yellow and black sunburn. 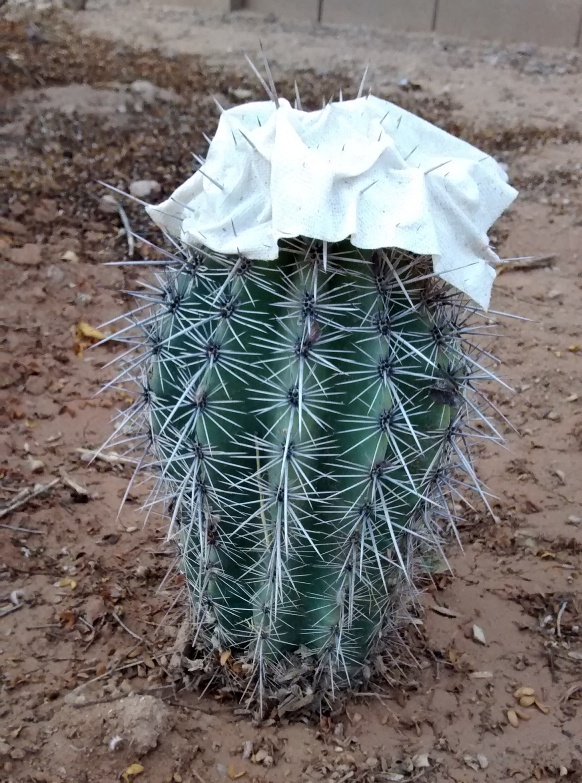 A cardon is a cousin to the saguaro. Some heat stress is normal for this time of year. 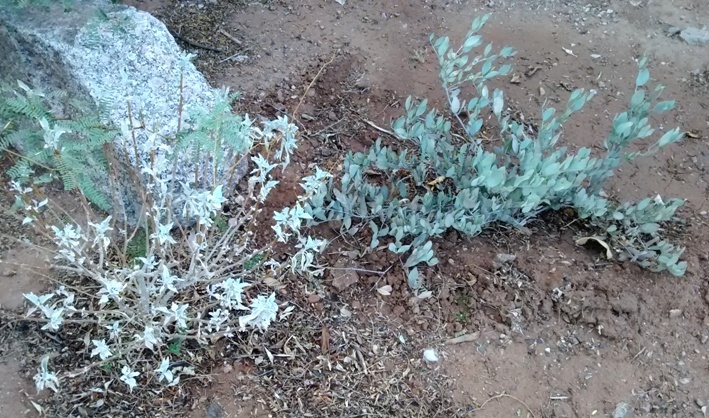 The brittlebrush and penstemon go dormant the entire plant may appear dead. My rose bush looks seriously neglected. 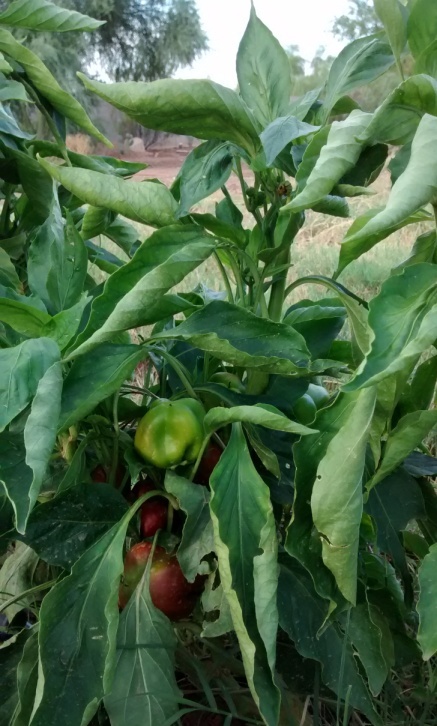 We have a row of bell pepper plants in the garden that amazingly survived (with daily water), though the peppers roasted on the plants before we could eat them. I’m hoping the plants will be able to produce better through the fall, to make it worth keeping them alive. 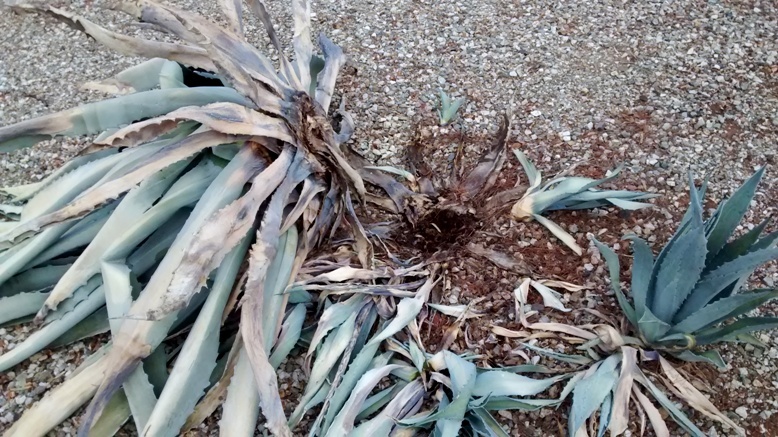 Blue agave that died from an agave beetle. Since I don’t treat my plants with insecticide, all of my blue agaves will eventually die and be replaced by the pups. Our neighborhood experienced some saguaro carnage this summer as monsoon winds ripped through our street. A five foot saguaro broke off near the base. It had previously developed cracks from overwatering and couldn’t withstand the wind. A reminder that even tough native plants can succumb. The contracted pleats of my young saguaros indicated they need a drink. I’ll water them weekly until they plump back up. 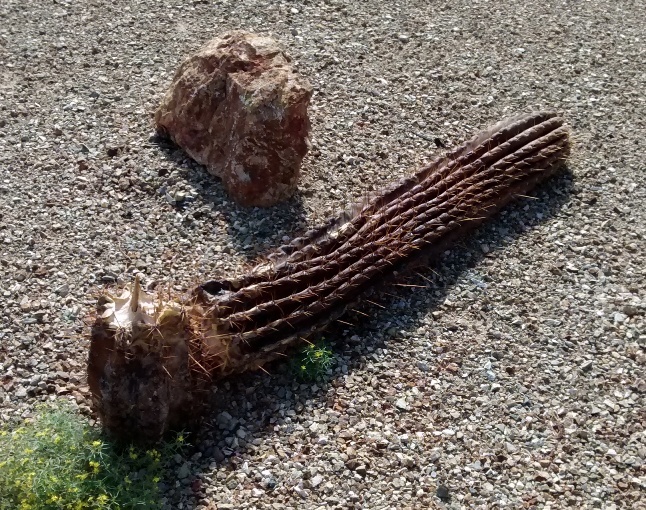 Remember that a saguaro will absorb all of the water its roots allow, so watering when the ribs are expanded can lead to the cracking that killed my neighbor’s plant. 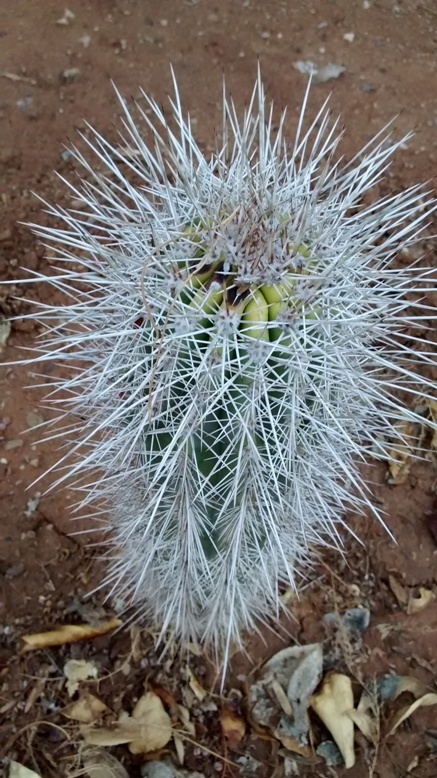 Baby saguaro with contracted ribs. I put a paper towel over the top to shade the sunburn. 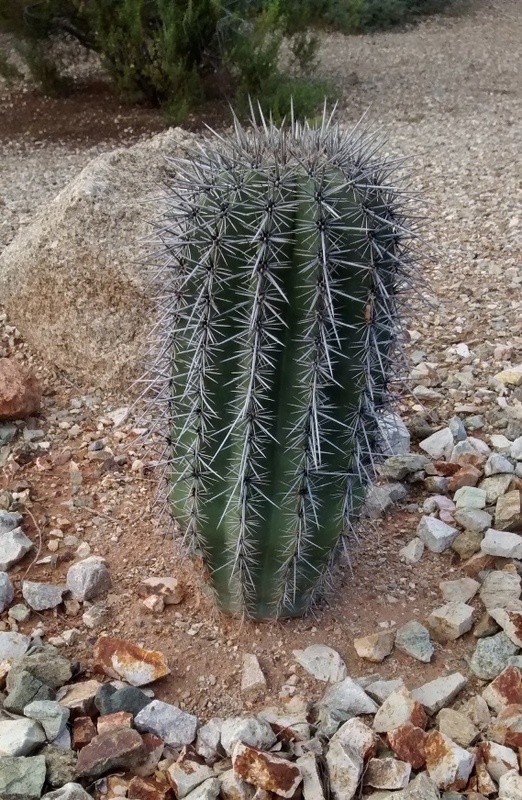 Baby saguaro with expanded ribs. 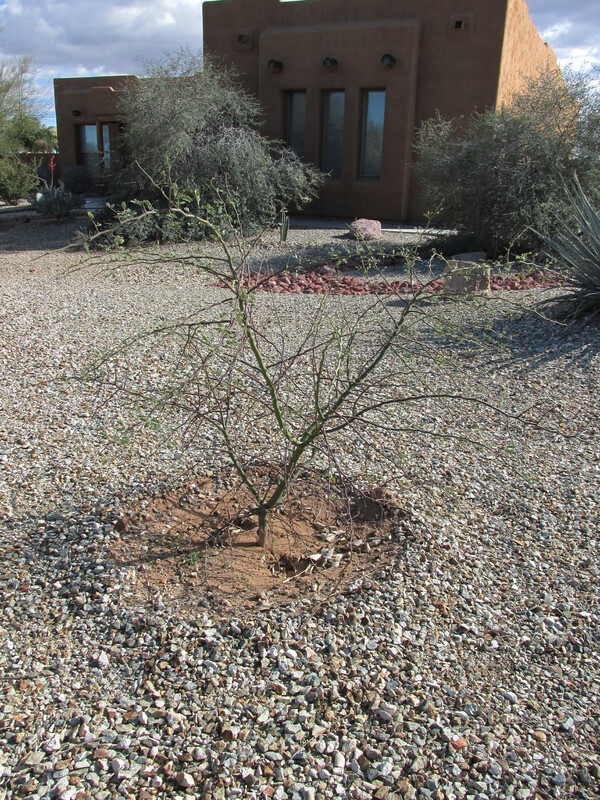 When I plant a young desert tree, I build a basin with edges about 2 feet away from the tree’s trunk. I’ll start by watering the tree every few days for the first week or two while it recovers from transplant shock, then I fill the basin once a week while the tree gets established, about the first year. After a year, a desert tree can live with watering once every 2 to 4 weeks. If the tree seems to be growing slowly, you can increase the water frequency to no more than once per week. 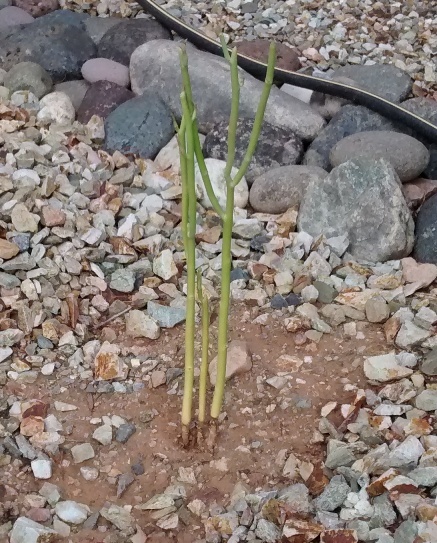 A lush baby Palo Verde tree with a 2 foot basin. As the tree grows, expand its basin. Once a year in spring you can rebuild the sides of the basin farther away from the trunk. The basin around the tree allows you to give a large drink with each watering, penetrating farther into the soil and allowing the trees roots to grow deeper. Shallow watering encourages shallow roots, which allows the top of the tree to become heavier than the root strength. In order to allow the basin to fully fill, turn a hose on at a trickle and set a timer for an hour, monitoring to make sure your basin doesn’t overflow. Or if your tree is on your irrigation system, you can add the number and flow rate of emitters needed to fill the basin in the time scheduled for your system. A larger basin on a more mature desert tree. This basin measures about six feet across and is doughnut-shaped to encourage roots to spread away from the trunk. This tree blew over a few times while young and needed stronger roots. Once my desert trees have doubled in size or seem well established, they can be watered even less frequently. A few of my trees border a low spot in my yard where water pools when it rains. These trees are not on my irrigation system and I hardly ever water them by hand. The winter and summer rains give them deep drinks which keep them healthy. They usually keep their leaves all season long, so I know they are getting enough water. 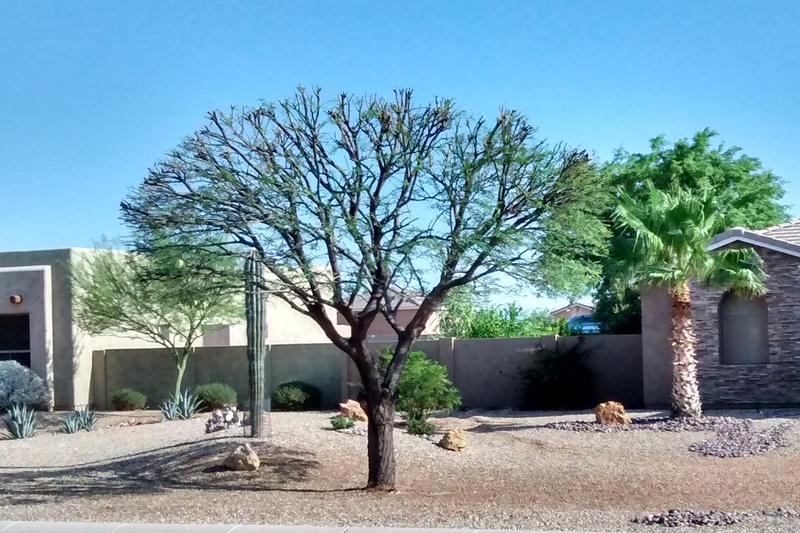 This Foothills Palo Verde has been in the ground about 5 years and no longer needs any irrigation since it borders a low spot in the yard. 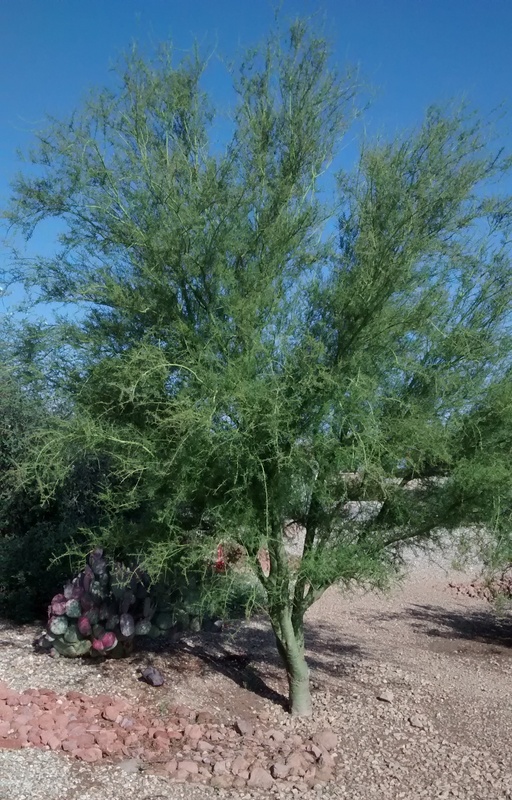 When watered appropriately, desert trees grow slower with more proportional shape and stronger branches. Over time they can still grow to mature heights of up to 30 feet, and much more quickly than they would in the desert. Ironwood leaves die in spring? This spring, all four of my young ironwood trees lost their leaves. The leaves turned yellow just as spring growth happened all around them. I thought somehow my trees were dying, though I didn’t see any reason why. About a month after the leaves started dying, I saw new growth. All four trees have now grown new foliage. My young trees have never flowered, but perhaps their leaves had remained on the tree long enough to need to be replaced. Ironwoods remain my favorite desert tree due to their size, leaf color, wildlife habitat, and shade. Some day I hope to have a large wildflower area with three mature ironwood trees as the backbone. I’m glad these trees are okay. They grow slowly and would be hard to replace. Xeriscape doesn’t have to be expensive. A xeriscape landscape can be cheaper to build and maintain than a regular landscape. Do you want to change your landscape but have no money? Well, you may be surprised at how much you can do for free. Try these ideas. 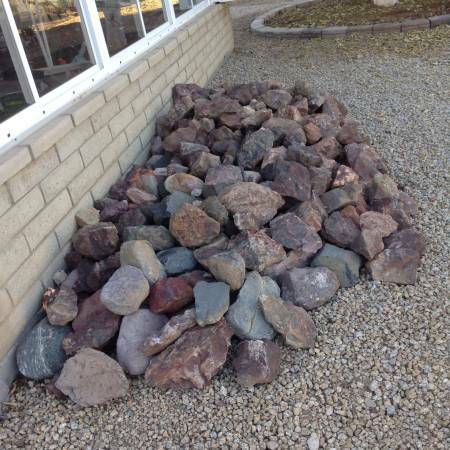 Craigslist has a free section where you can find landscape rock regularly. If one ad doesn’t provide enough for your project, you can collect a few types and try mixing them before spreading. Be aware that if you mix multiple types you will never be able to buy more that will match. That might not be a big deal as landscape rock tends to sink into the dirt over the years and you can add rock on top that is similar in color with no problem. You can also get free plants on craigslist. Prickly pear can be propagated easily. One free prickly pear plant on craigslist can provide enough starts for your yard. If you make prickly pear the major theme plant of your landscape, you may complete your entire landscape for free. I don’t recommend trying to move a mature tree or saguaro cactus. Mature trees are too large to move without construction equipment. You will only be killing it and providing free tree removal. Moving saguaro requires permits, so even a “free” saguaro isn’t really free because you need to hire a saguaro moving company to get it to your yard. Do friends or neighbors have a mature landscape? Chances are they have volunteer plants they could give to you. 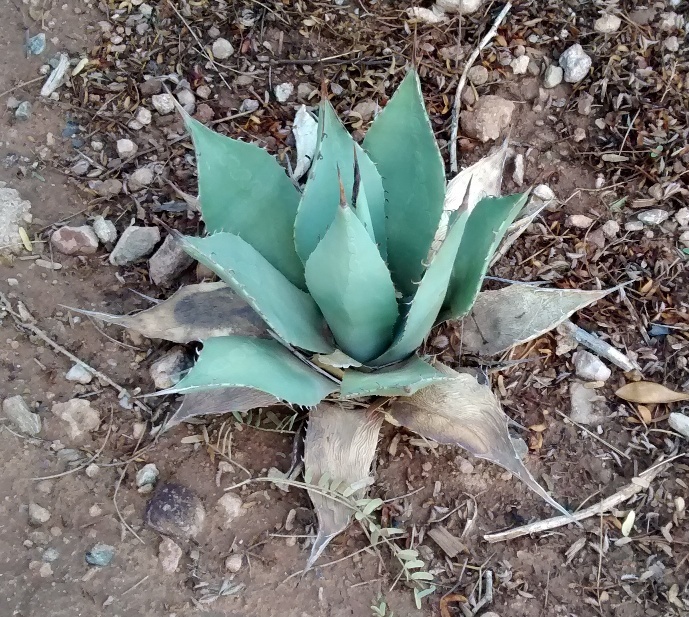 Many agaves make pups that can be dug and replanted. Texas sage bushes sometimes have small seedling bushes growing around their roots. Grasses can be divided into smaller clumps. 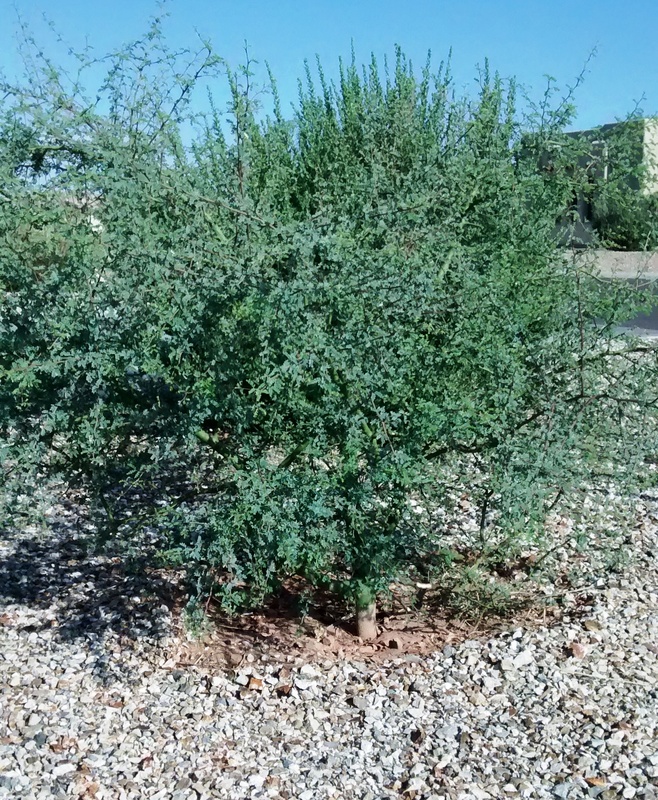 Baby creosote bushes can be transplanted if you are careful to not disturb their roots. I have also transplanted seedling palo verdes and mesquites. If you truly have no money and want trees, these will work. But in my opinion they are not worth the effort because they take so long to reach mature size. Xeriscape allows you to leave a large percentage of your yard empty while still achieving a landscaped look. If you can’t afford to buy a large variety of plants, do something interesting with a mass planting of one kind of plant that is easy to get for free. 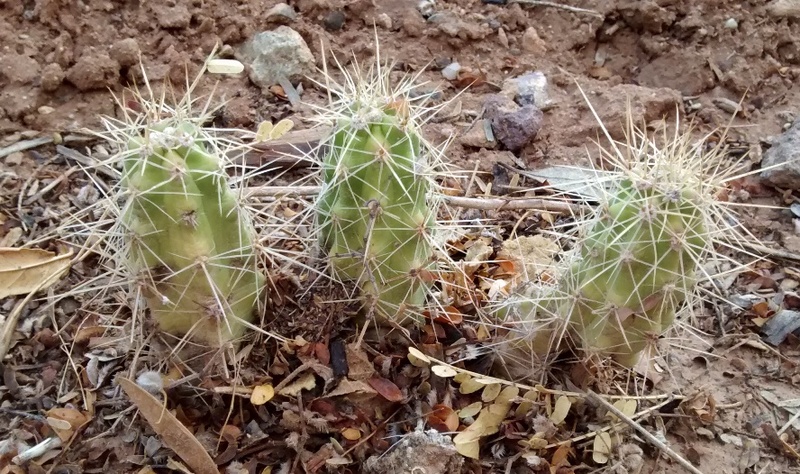 Creosote and cholla can be grown without an irrigation system. Consider going ultra-low water and designing a landscape that doesn’t need an irrigation system. 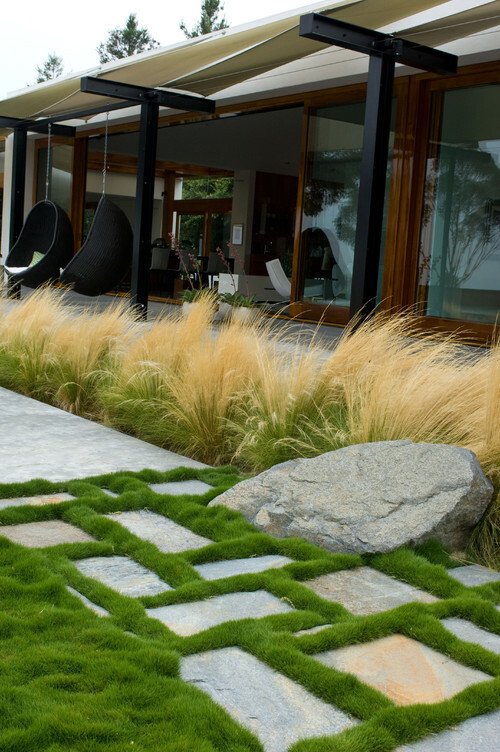 For a mass planting, grasses especially look modern. 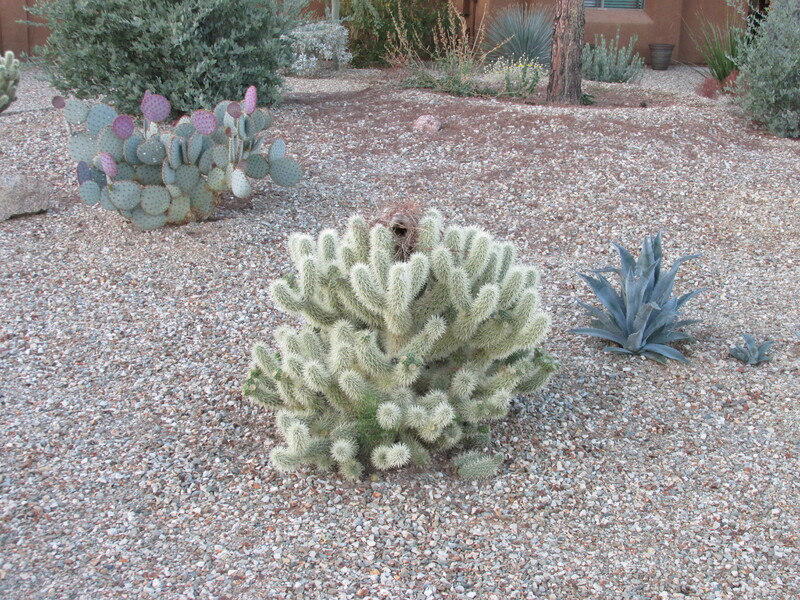 Try a row of grasses with a few clumps of prickly pear. Mexican feather grass planted in a row for a modern look. This new year, you’re probably already thinking about what you’d like to accomplish in 2015. Here’s my challenge: do something for your landscape! If you’re like me, there is probably a drip irrigation emitter somewhere in your yard with no plant. As in, the plant died and never got replaced. It is so easy to find a plant and fill in that empty spot. The water is already there, no extensive landscape work required. You can even do something as simple as making a cutting of prickly pear and putting it in the ground. (You’ll have a slightly higher success rate if you root it in a pot first). Perhaps you have a hole somewhere and you’d like to try something new! Do you need more bushes to fill in the backbone of your landscape? Maybe a new focal point plant like a Spanish dagger? 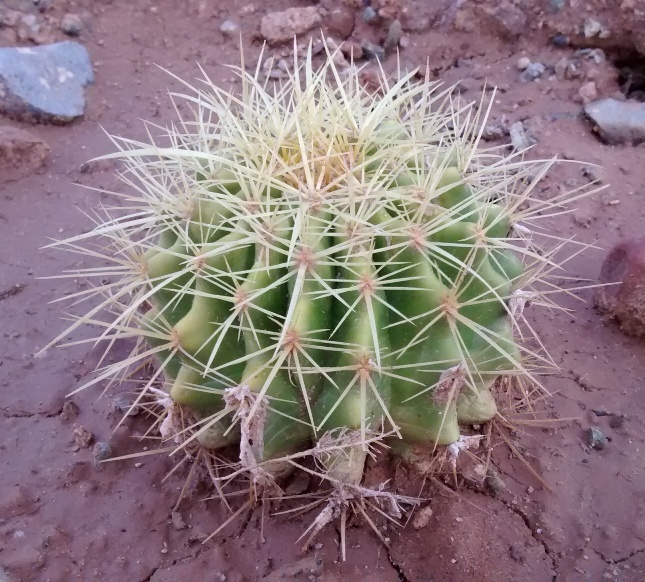 Perhaps your empty spot is small and you’d like a hedgehog cactus that is unassuming until it blooms. Here are some plants I would love to find and try out in my yard. If we have some more pleasant weather this week, get outside and enjoy working on your landscape! My landscape is always a work in progress. I joke that I don’t need patio furniture until that future day when I have some time to sit down. But lately I’ve been thinking more about creating spaces that draw me and make me want to sit and enjoy the peaceful feeling nature brings. All of us need daily meditation for our spiritual well-being. It can be really hard to remain somewhere for more than 15 minutes, but I feel like nature is a perfect place for self evaluation, fresh air, and spirituality. My ideal peaceful spot has lush plants, a comfortable seat, sun and shade, and wildlife to watch. This year, I plan to spend more time in my spot and find ways to improve it. A peaceful spot begs to be a little more private and secluded than the rest of the yard. I liked these ideas for adding privacy to any yard from Listotic. I updated their post with pictures I found. Using plants to create walls serves both functions: gardening and privacy. trailing vines create privacy. Source pinterest. A screen helps define a space and can create the structure of the garden. I loved this DIY idea for beautifying an outdoor room. This option probably isn’t good for Arizona. 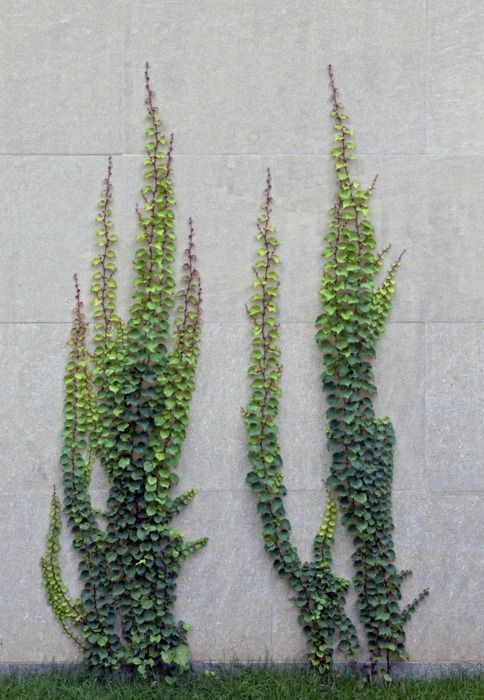 A vertical garden is more labor intensive but serves the same dual function of plants and privacy in one space. These help define a space while allowing some light through. Vines can also be grown across the lattice. More vertical gardening ideas. For a space to feel secluded you may want to keep it small and balance light and shade. If your porch is your peaceful spot, potted plants make a great barrier. 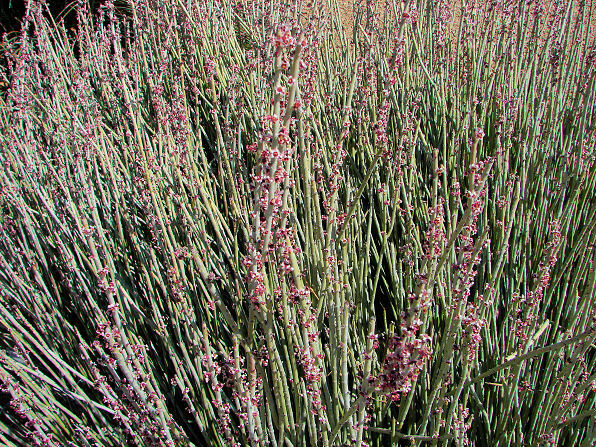 Consider giant hesperaloe or Spanish dagger to create a look like this. I’ve seen hedge walls of Italian cypress grown close together. The trees can be topped when the desired height is reached. This idea gives a more shabby chic look. These bottles were made into a separate fence, but I like the idea of adding some art atop a fence to add height. You could also line potted cacti along a fence. This may be an option if you don’t want to worry about watering, trimming, or maintaining an area. If you live near a busy street, your peaceful spot may need some white noise to help create the right mood. A water feature could serve this function.